When I’m out for sushi, the one thing I order every single time is avocado maki…usually two rolls. They are so rich and creamy with their slightly chilled, ripe avocado center. Dipped in soy sauce, they are my idea of heaven. This recipe is (obviously) inspired by this favourite sushi roll. We often see dishes creatively presented in deconstructed form…this might be the opposite of that? 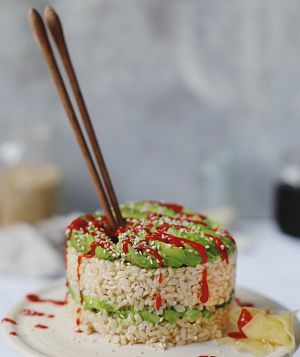 Avocado Sushi Cake is like 12 maki bites in one, layered with avocado, spicy-sweet Sriracha, nutty sesame seeds and my favourite tangy twist on soy sauce. It’s perfect for sharing or for carb-loading the night before a long run. 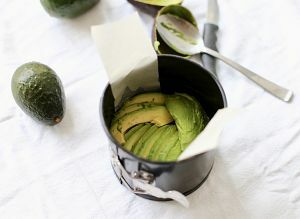 Avocado recipes are great for obvious reasons…but also, because this luscious green fruit is always in season in Mexico, and 90% of the avocados imported to Canada are from our Spanish-speaking nation to the south. They are available 365 days a year. 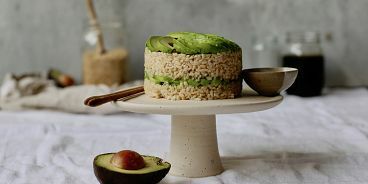 Avocados are also extremely versatile — I love them in sweet and savoury dishes. See my last chocolatey avocado recipe here and scroll down for the latest. Enjoy! Cook your brown rice according to package instructions (mine called for 1 c. rice to 1 1/2 c. water, then bring to boil, cover and let simmer for 30 minutes). Oil up a springform pan and place a circular parchment cut out on the base for easy removal. For extra easy removal, cut two long strips of parchment and lay these in the base of your pan with the sides sticking out the top like little pull tabs. Once your rice has cooked, transfer to a non-metal bowl and let cool. Using a non-metal spoon (ideally wood) stir in the rice wine vinegar for seasoning. Now, time to layer your cake. Using a spoon, your hands, or an ice cream scoop (I used the latter) add your first layer of rice to the base of your springform pan. Press down firmly (but not too firmly). Wet your fingers in between pressing to prevent rice from sticking to your hands. Next up, add your avocado layer. I used a whole avocado for each layer, but you can adjust according to your preferences. 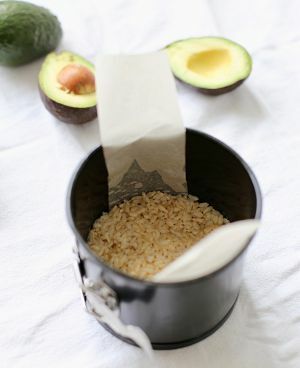 Simply slice your avocado from top to bottom, then fan the pieces over the rice. Add a sprinkle of sesame seeds and a drizzle of sriracha here, if you like. 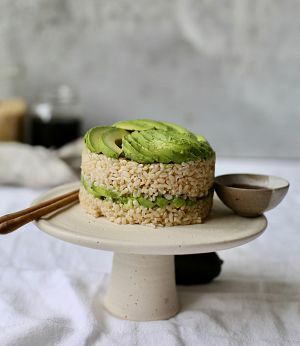 Add a second layer of rice and then keep going with your layers, or finish here and top with a beautiful fan of avocado layers. Garnish with sesame seeds and sriracha. For the dipping sauce (my favourite), simply combine all three ingredients in a small bowl and stir to combine. Thanks to Avocado From Mexico for sponsoring this post! Check their site here for tons more avocado recipes.